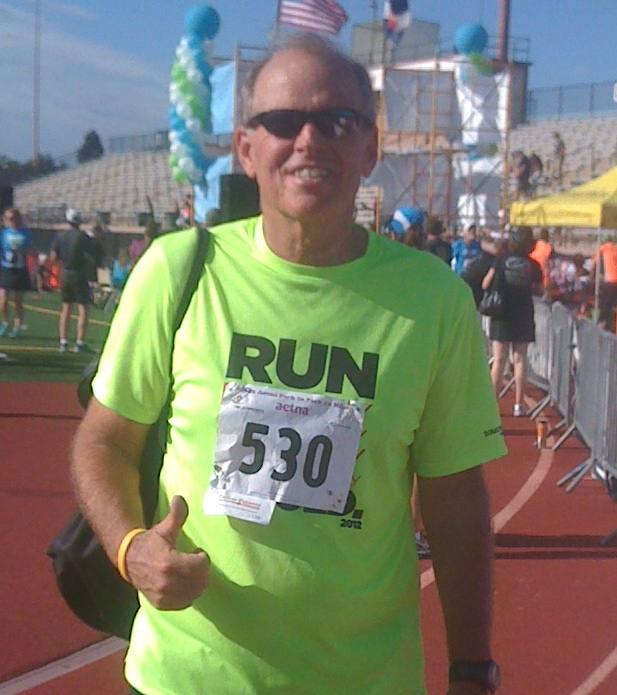 On October 3, 2012 after 46 years, one month and 21 days of running, I ran my 100,000th mile. It came in mile 7 of a moderately uneventful 8 mile run in the Cherry Creek State Park during recuperation from a calf injury. Like most runs, there was nothing particularly unique about it. I ran the first 4 miles alone and was joined by my wife, Linda, for the last 4. The story prior to that run, however, set the foundation for many, many miles. It began mostly because I didn’t want to be embarrassed. The first day of Cross Country practice was Monday and it was already Friday, August 12, 1966. I needed to get in shape fast! So I laced up my new Beta Bullets and went for a run. It was a half an hour in duration and the only thing I recall is that it seemed like FOREVER! The next day, I did it again. I took Sunday off (well, it was SUNDAY, right?) and reported for practice bright and early Monday morning. I had no idea what was to come and especially the significance it would have on the entirety of my life. 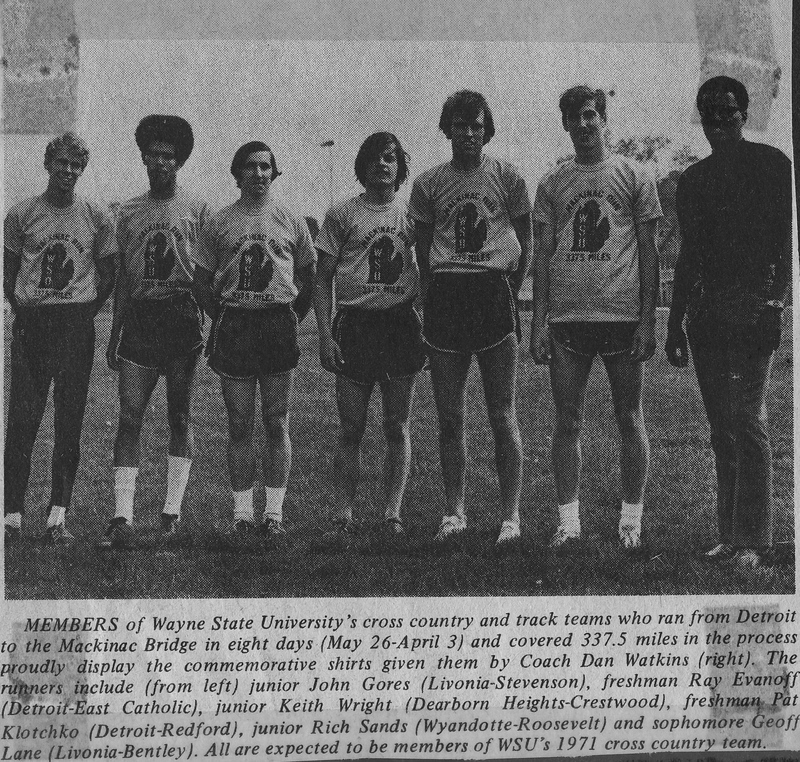 I wasn’t showing up at just any cross country practice, I was going to be a member of Coach Al Pingel’s Wyandotte Roosevelt High cross country team, one of the best in the state. 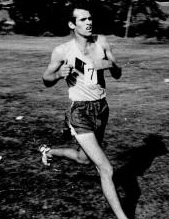 The running Bears had been in the top three at state regularly and boasted the defending state champion, Al Ruffner. And, at least in my mind, there were expectations placed on my performance. In Junior High, part of P.E. was running this thing, ominously called “the distance run.” It was actually a mere 3/4 of a mile, but in 7-9 grades, someone must have felt that was a long way. I remember doing it fairly well as a seventh grader, beating everyone in my class. In eighth grade I broke the school record (which was around 4:20) by running 4:02. The next year, 3:36. The next day, high school coach Al Pingel was at class. Game, set, match: I was a cross country runner. At the morning practice, we warmed up, stretched as a team and ran the workout. It was 6 x 440, followed by some kind of drills followed by the unfathomable news that we were expected to return later that afternoon for a second workout. A second workout? This guy was serious (Coach Pingel, not me). That afternoon, we ran for 45 minutes. He called it the Boston Marathon and it was the first time I had ever heard of that race or run that far. I made it, learning that my body was capable of doing things that my mind wasn’t so sure about (wouldn’t be the last time for that lesson). I also was taught that day the importance of logging my runs, so I did (still do). The next day, I could barely walk (backwards down stairs). Somehow, I lived to tell about it. Cross Country, and then Track and Field allowed me the opportunity to travel to other schools, meet other runners and to experience a part of the sports world different from my earlier participation. I had played some football, a little basketball and I don’t mind saying, was an excellent baseball player (pitcher). I liked being on a team, but cross country supplemented the team part with the individual focus. I could run well and win. There was no worry about a shortstop making an error allowing in the winning run or a teammate missing a free throw at a crucial point of a big game. Those three things: travel, people and the individual challenge were part of the draw for me. They’ve also been part of the big payoff. As a collegiate, post collegiate, and as a marathoner, I have traveled to places I would have never seen had I missed this golden opportunity. I’ve made, and continue to make, some wonderful friends. I’ve won some races, accomplished goals, ran in a few national championships, ran from Detroit to Mackinac in seven days during Spring Break (342 miles), represented my country once, and met a plethora of other more self-directed challenges. And frankly, I’m not convinced I’d have gone to, or completed college had it not been for my involvement as a runner. I most certainly would not be the person I am today. More than 100,000 miles later (Yes, Coach Pingel, I log my miles), I happily acknowledge that 46 years ago, I began a journey that would transform my life with a simple 30 minute run. And while the travel, people and the racing have all been rewarding, I knew that first day that there was something I really liked about the act of running. I wasn’t exactly sure what it was, but I feltsomething. And upon reaching the 100,000 mile mark, I am grateful for what this simple aerobic activity has done for every facet of my life and being. Running was/is a simple activity, cyclical in its nature. One foot placed in front of the next in order to move forward: to cover ground, to open my mind, to allow me opportunities to escape my troubles or celebrate my triumphs. Mostly, to connect me to and strengthen my relationship with this planet upon which I exist. For that, I am ecstatically, humbly grateful. I am proud to be a runner. For anyone amazingly bored (or interested), I recorded the 100,000th mile. It can be found at http://youtu.be/2pjFn-0-Z48. Good luck with that!